This review is for the VantisLife Health Insurance Company. The VantisLife Health Insurance Company is available through many different organizations and companies, and offers both life insurance and annuities. However, it does not offer any type of health insurance product and no vision or dental coverage either. If you are looking for health insurance coverage, you must contact another company or carrier besides VantisLife. Having trouble finding health insurance coverage for you and your loved ones? Just enter your zip code below to find health insurance rates near you! Previously known as the Savings Bank Life Insurance Company, VantisLife was formed in 2002. The company has been existence since 1942, and its goals are to provide individuals and families with many different life insurance and annuity options, with a focus on affordability and customer service excellence. With nearly $5 billion in life insurance premiums, and almost $700 in annuities, VantisLife is one of the largest life insurance companies in the United States. The corporate office of VantisLife is located in Windsor, Connecticut, and the main customer service phone number is 1-800-252-7254. VantisLife has earned a rating of A- (excellent) from the A.M. Best Company for financial strength. As mentioned previously, VantisLife offers two different options when it comes to products, life insurance, and annuities. Life insurance is considered a binding agreement between the insurance company and you. During the term of the contract, which can be any specified amount of time, an insurance company such as VantisLife will pay an agreed upon sum to a person, usually your beneficiary, after your death, provided you have made all your premium payments on time. On the other hand, an annuity, while also a contract between the insurance company and yourself, has some differences. Life insurance companies originally introduced annuities to offer retired individuals an option for additional and fixed income. For example, you make payments to a company that issues annuities, and that company agrees to make payments of principal and interest to either you or a beneficiary that you choose. VantisLife offers several different life insurance products, depending on your family and life situation. 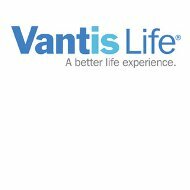 VantisLife focuses their products on different population segments, including families, women, and mature adults. There are many different life insurance products offered for families. These include the term life insurance product offered by VantisLife known as VantisTerm. This coverage is a 15-year term policy that provides additional income to the family in the event of a death of parent. The funds are usually enough to cover college expenses and burial costs. The Permanent Life Insurance product offered by VantisLife provides protection through the insured’s life to pay for burial expenses as well as any other debt that might still able remaining when there is no longer any other source of income. VantisLife offers a mortgage protection product that will pay off the mortgage either in full or at half of the remaining balance. There is also a product known as Children’s Term insurance that is designed to protect the insurability of any child if there are unexpected health expenses due to an illness. Finally, VantisLife offers a Term ROP life insurance product. The ROP stands for return of premium, and allows the insured to receive up to 100% of their premiums returned to them if they are able to outlive the original terms of the policy. As far as annuity products, VantisLife offers two different options. The first one is the fixed option, which allows you to earn a fixed rate of return from your insurance company. The variable option will invest your money into either stocks or bonds, on the overall payout will be dependent on how these funds perform. You can get either a variable payout or a fixed payout with this option. Another benefit of a fixed annuity is that the issuing insurance company, no matter how much the market fluctuates, guarantees the payouts. Variable annuities are not guaranteed in any way. In addition, it is important to remember that any gain that is realized from a withdrawal prior to 59 ½ years of age from a fixed annuity has to potential to be taxed and might be subject to an additional fee from the IRS. There are many important factors to take into consideration when looking at life insurance and annuity options, and it is always best to speak to a financial professional or accountant before making any decisions involved large financial contributions or commitments. Looking for health insurance? Even though VantisLife does not offer any coverage, many companies do! Enter your zip code below to get health insurance quotes today! I have been paying faithfully $44.33 a month For some time now and have not had any issues with making payments and always been on time. I just pray when I go home to Jesus that after all theses years Of faithful payments that policy holders keep their agreement before the eyes of our most holy God praise His holy name.